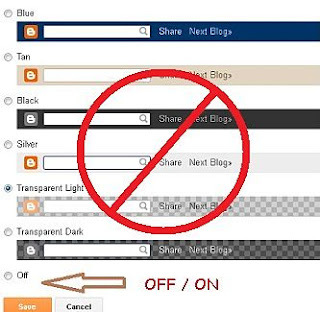 Features of the Blogger Default NavBar and How to remove it. Why did i remove my NavBar? - I was trying to reduce size of page header. [B](The Blogger Logo): takes you back to www.blogger.com. Search box: Searches the content of the blog you're viewing and posts the results directly on the page. Share: Lets you share the blog you're viewing to social websites. Report abuse: Found a blog violating Blogger Terms of Service, report it. If you don't see this link (ie, the blog may be using Dynamic Views, or has removed the NavBar). NextBlog: Shows you a randomly selected Blog that has been updated recently. [email address]: The shows the current Google email address signed in. Dashboard: If you're signed in, this link will take you to your Blogger Dashboard. Sign In/Out: This displays the appropriate option, depending on whether you're signed in or not. Unlike Most Blogger template edits which require you to add or remove code in the template - The Navbar Can be Turned OFF from the Layout tab in Blogger Dashboard. Click the "Edit" link on the Navbar page element and select Desired NavBar colour - Or Turn it OFF if you wish.. Here's a Post i wrote about permanently removing the NavBar Excess space From Your blogger Header.